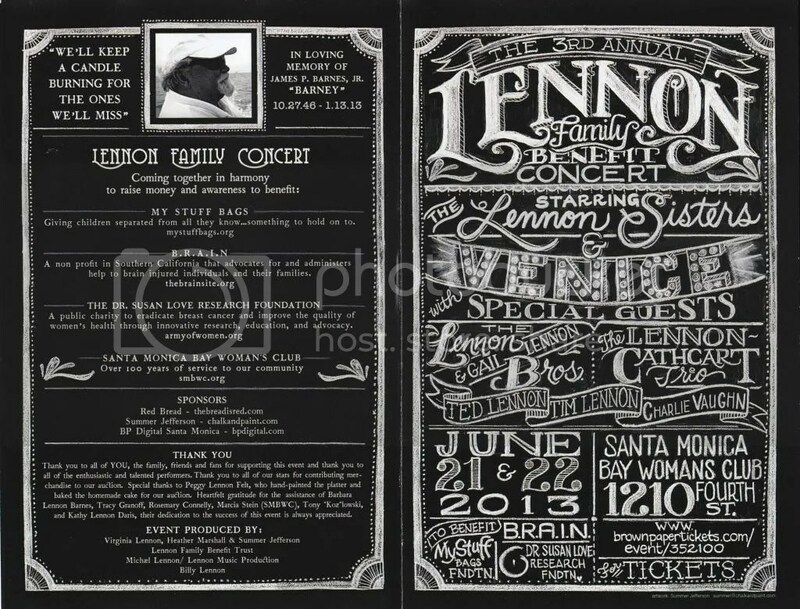 Saturday night I was privileged to be in the audience at The Lennon Family Concert, an annual fundraiser in Santa Monica, CA. 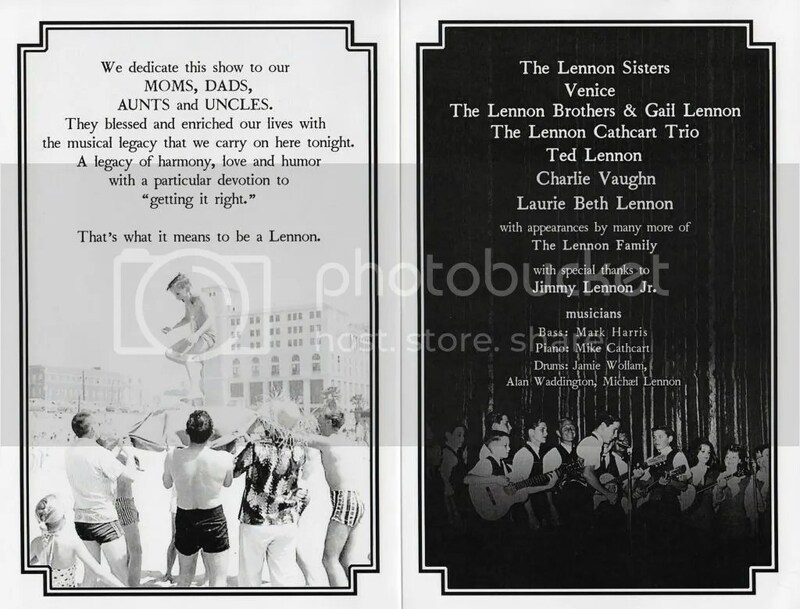 Officially the line up was The Lennon Sisters, Venice, The Lennon Brothers & Gail Lennon, The Lennon-Cathcart Trio, Ted Lennon, Tim Lennon, and Charlie Vaughn. Unofficially the lineup was somewhat more… flexable. I’m sure the amount of organization it took to pull off a night like we experienced was staggering, but it didn’t feel organized at all. If felt like the Lennon family invited some people (the audience) over to visit, and members of this uber-talented family wandered in and out of the room (on and off the stage) in various combinations all while singing, playing an instrument, or both. Our seats were in the very last row so pictures are a little blurry and videos are shaky and often interrupted by audience member’s heads, but I think they will give you a little peek of what I experienced. I hope you enjoy them! The opening number from the show will sort of give you an idea of the family atmostphere up on stage. All 6 of the Lennon girls took the stage together performing The Heather on the Hill from Brigadoon. Then it was the boy’s turn. Finally all 11 siblings took the stage together. The grand finale had I-don’t-even-know-how-many Lennons on stage singing the Venice song Family Tree. Appropriate and beautiful. These are just some of the high-lights, there were so many wonderful performances throughout the night. I remember years back when some band members were welcoming children, last night a few of those children took the stage and showed they are as talented as the rest of their family. It was a truly magical night! The charities benefited by The Lennon Family Concert are The Santa Monica Bay Woman’s Club, The My Stuff Bags Foundation, B.R.A.I.N., and The Dr. Susan Love Research Foundation. This entry was posted in Photography, Reviews & Recommendations and tagged Charities, Charlie Vaughn, Concerts, Kipp Lennon, Lennon Family, Lennon Sisters, Mark Harris, Mark Lennon, Michael Lennon, Music, Pat Lennon, Photography, Singing, Songs, Venice, Videos on June 22, 2013 by Jennifer Kaplan.